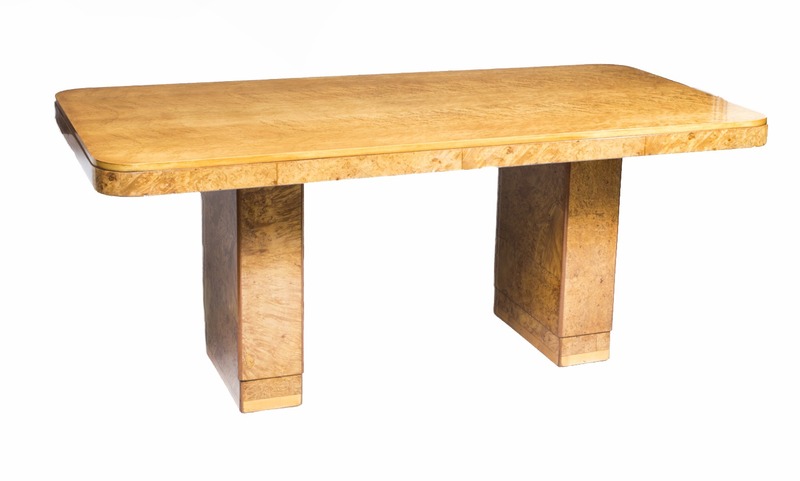 It seems that Antique Art Deco furniture never goes out of fashion and there seems to be a constant interest and demand for top quality pieces. As our customers are probably aware, Regent Antiques is well known as a specialist dealer in Antique dining tables so it is especially appropriate that we should be offering for sale this very fine Antique Art Deco Dining Table complete with 6 Cloudback Chairs, dating from around 1930. This is an antique Art Deco birdseye maple and burr walnut dining set which includes a substantial dining table that will seat six people in comfort together with a matching set of six comfortable Art Deco Cloudback dining chairs upholstered in cream leather. The dining table is an oblong shape with rounded corners and is supported by a pair of robust pedestals. 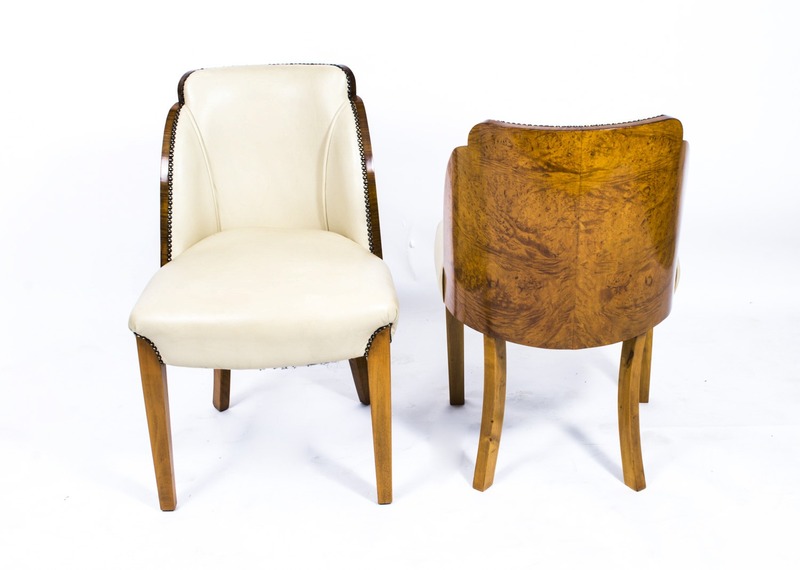 As can be seen from the images supplied, the Cloudback chairs are supported by square tapering legs and are upholstered in a close-studded style with a luxurious cream coloured leather an have backs that are beautifully veneered in burr walnut. Although this is a period set the timeless nature of the Art Deco design means that it will live comfortably alongside other more recent styles and fit seamlessly into almost any style of interior. 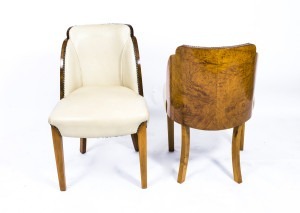 This Art Deco furniture is in excellent condition and has been carefully restored in our own workshops. 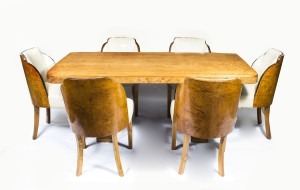 This lovely set is offered for sale at a very reasonable £7500 and you are advised to take a closer look very soon as Art Deco Dining Tables are very popular and we do not expect to have it available for sale for very long. You are strongly advised to visit our showroom where we have numerous other Art Deco furniture and other items on show.